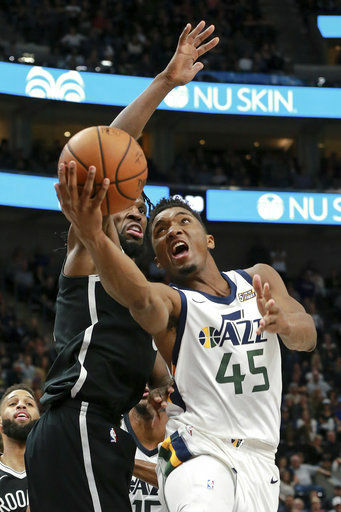 SALT LAKE CITY (AP) — Donovan Mitchell scored 26 points, including four in the final minute, to lead the Utah Jazz to a 114-106 win over the Brooklyn Nets on Saturday night. 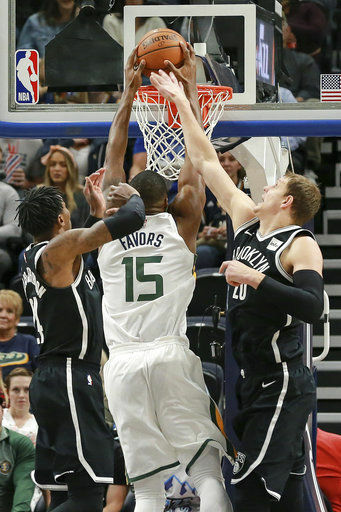 Without Rudy Gobert, who sat with a bruised knee, Derrick Favors had season highs of 24 points and 12 rebounds and the Jazz snapped their four-game losing streak. After trailing by 12 with 3:52 to play, DeMarre Carroll led a last-gasp comeback with six quick points to pull Brooklyn to 108-104, but Mitchell hit two free throws and had a sensational tip-in to clinch the victory. The Jazz have been one of the few holdouts in the new small-ball era in the NBA, as they usually feature two non-stretch big players. With Gobert sidelined, Utah often had just one interior player on the floor and it worked. It also didn’t hurt that the Nets were finishing a five-game road trip and a back-to-back. D’Angelo Russell scored 26 points for the Nets but limped to the locker room with 2:35 to play and did not return. Rondae Hollis-Jefferson had 19 points and Carroll finished with 15. The Nets led 25-20 in first quarter before the Jazz went on the kind of burst they’ve seldom managed this season. Hood broke out of a recent shooting slump with 14 points in a Utah’s 25-4 run. Hood, who had shot just 27 percent in his last five games, made a 3-pointer with 7:58 before halftime that gave the Jazz a 45-29 advantage. Mitchell also bounced back from going 8 for 35 in his last two games to shoot 10 for 18 and come up big in the clutch. The Nets lost three of five on their trip. Nets: Trevor Booker returned after missing four games with a sore lower back and supplied his typical intensity, scoring 12 points and picking up a technical in the second quarter. … Coach Kenny Atkinson said before the game, “We’ve won a couple of road games, and now the next step is, can we perform better on a back-to-back. We’ll see.” … The Nets still haven’t won consecutive road games since the 2015-16 season. Jazz: After Friday’s game, Gobert tweeted a video of the play, saying, “Dove for the ball right…” and also told reporters he thought Dion Waiters crashing into his knee was a dirty play. … The Jazz haven’t topped the 50-percent mark for field goal percentage in a game since the opener against Denver but came close with a 48.2 percent. Nets: Finally return home to host the Celtics on Tuesday night. Jazz: Host the Timberwolves on Monday for their eighth home game in their last nine.